MODERN SALON Media has released the list of 2013 “Excellence in Education” honorees in MODERN SALON’s annual program recognizing leadership and best practices among cosmetology schools. MODERN SALON Publisher Steve Reiss presented the complete list of honorees in each class and announced the top tier, “Overall Honorees” for each category during a special presentation at the AACS (American Association of Cosmetology Schools) annual convention in Las Vegas on Saturday, November 16th. Hundreds of entries were submitted to the Excellence in Education program from cosmetology schools from across North America, in eight categories ranging from marketing to placement to school culture. Honorees were determined in separate classifications based on school size and whether entering as single location or a complete, multi-school organization. Overall honorees were chosen in each category from a list of previously selected list of finalists. The Excellence in Education program has been presented annually since 2010 by MODERN SALON Media with the support of the AACS. All North American schools with students attending since January 1, 2012 were eligible for the 2013 program. For more information on the Excellence in Education program, go to modernsalon.com/ExcellenceInEducation. With a strong presence in the Greater Salt Lake region, Cameo invested in online and social media marketing in 2013, but gives credit to ongoing events and a strategy Cameo leaders call “Event-ing Our Business” as the greatest driver of marketing success. For example, on the Wednesday prior to Mothers Day, the school is closed in order to offer skincare services to the public free of charge. Gift cards are 50% off, retail products are 25% off and up to $2,500 scholarships are given to all student enrollments on this day only. This annual skincare event alone generates 1,600 attendees, $800,000 in student enrollments, retail sales of $22,000 and gift card sales of $105,000. Other school owners from across the country have attended this event and have implemented within their own beauty academies. At every event, Cameo captures each participant’s name, e-mail, cell number and address in order to target future promotions and events through text, e-mail and direct mail marketing. In 2013, Capri created a customer reward program using tablet technology. Customers receive incentive points for every dollar spent on services and products. Tablets are available on clinic floor so clients have the ability to submit the appropriate information to enroll in the reward program. Capri also completed a revamp of all online media and social media programs, including the creation and distribution of a mini documentary about the school that beautifully and visually explains success stories of previous graduates, current programs offered, and why to choose Capri College. Adding Pinterest and Instagram to existing Facebook and Twitter platforms to showcase trends and school happenings, along with the launch of an official school blog, have increased traffic and interest from around the world. In 2013, Aveda Institutes Texas transitioned all course materials from textbooks and DVDs to an iPad-based curriculum, with iPads included in student kits. This provides students with access to cutting-edge education and videos during and after graduation. Students also leverage the technology to create a digital portfolio of work, and to enhance collaboration with instructors, peers and future employers. The comprehensive placement program at Eric Fisher Academy includes quarterly career days with owner panels and speed interviewing; regular salon and spa tour visits; and Look and Learn Demos with popular industry guest artists which are open to all licensed cosmetologists from the area, to encourage networking and collaboration between salons and students, and showcases the culture of the school. Each team member at Paul Mitchell Schools has a role in placement by supporting and participating in a Professional Development Program. This long-term program includes projects, events, and activities designed to help students explore career opportunities, identify career choices, discover the skills needed to succeed, find and work with mentors who have knowledge in their chosen field, attract their target audience (customers) and market themselves with business cards, résumés, social networking tools, and a complete marketing plan. Students complete a Personal Career Plan and Marketing Strategy; education team members utilize each student's personal plan for motivation in the classroom, on the clinic floor, and during individual coaching. The leaders at Aveda Fredric’s Institutes realize that many students desire to move to larger cities to begin their careers but lack the means to explore on their own. In 2013, they enhanced their placement program to include out-of-town salon visits. A chartered bus allows group travel to view multiple salons. Often these trips include an education class sponsored by the salon. The Empire Gives Back initiative supports more than 100 anti-domestic violence programs throughout the country through fundraising, complimentary beauty services and educational endowments. It offers support to the national Cut it Out campaign, a training program for hairstylists in which they are educated in recognizing signs of abuse. Additionally, Empire’s National Day of Beauty supports local anti-domestic violence initiatives throughout the country. Each October, Empire donates an entire day’s profits from each student salon to a local shelter in its area. The event is system wide, and held in October in honor of National Domestic Violence Awareness Month. Each one of Empire’s 110 schools in 21 states “adopts” a local anti-domestic violence program or shelter in its area. Throughout the year the schools support their shelters with various fundraisers and donations, along with offering free beauty services. Many schools also do clothing drives, food drives and toy drives throughout the year for the women and children in need. Finally, Empire Education Group offers educational endowments to residents and clients of shelters and programs that wish to attend beauty school. Xenon has participated in the “Beauty Changes Lives” campaign since its inception. Posters and banners hang throughout the Academy. Graduation ceremonies include a short video on industry professionals sharing their stories of how Beauty has changed their life, along with Xenon staff sharing their experience and ending with the tag line...”all because I’m a beauty school graduate.” Xenon advertising in local and community media includes the tag line “Beauty Changes Lives” and students are encouraged to participate in the National Beauty Changes Lives blog and scholarship programs. Xenon also offers Beauty Changes Lives scholarship opportunities, with students preparing a three-minute video or 500-word essay on how beauty can change their lives, and how they will change lives with a career in beauty. The leaders at Tricoci University wholeheartedly promote that a career in the beauty industry is not only a great choice but a sustainable and lucrative career. Mario Tricoci is actively involved with all ten campuses and visits each regularly to champion this message. In 2013, Tricoci University partnered with Crain's Chicago Business Magazine for an article titled "Beauty Schools Looking More Attractive" which discusses the strength of the beauty profession. Tricoci also touts that the organization employs 20 of its own graduates in careers ranging from from reception to Student Success Advisors to General Managers to Instructors. This state-of-the-art facility offers a modern and open feel. Guests are greeted by a Service Host who oversees the front desk area. In addition to 32 stations, clients experience a relaxing shampoo area with soothing fragrance and music enhancing the 5-minute stress releasing scalp massage. The school also features an open color bar and strong “green team” environmental strategies throughout. At 21,000 square feet and 120 styling stations, the Edmonton location of the Eveline Charles Academy is the largest Hair Design and Esthetics Academy in Canada. Located in a retail shopping centre in the city’s downtown core, embraces both academic and retail space/services with the look and feel of a premier salon and spa. The Calgary Academy mirrors the clean lines and open floor space of the other Eveline Charles business locations as well. Remington College’s - School of Cosmetology: Cleveland Campus, strives to offer its cosmetology students those” little extras” which will enhance their college school experience and give them a competitive edge in the employment world. 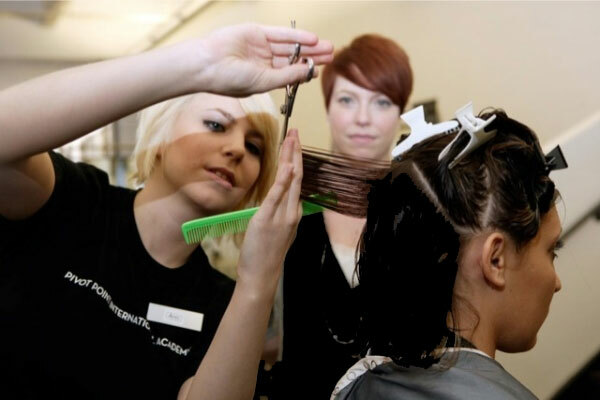 The College has an independent Program Advisory Board made up of professionals in the cosmetology industry who visit the school to review curriculum, student achievement outcomes, books, and equipment. This group includes representatives from the employment community who are asked to recommend program improvements intended to foster the development of the students in the cosmetology program. To enhance the cosmetology students’ interpersonal skills, the school offers periodic “complimentary services” to students in other academic programs as an avenue of promoting the cosmetology students’ hands-on skills as while showcasing their customer service skills. Finally, realizing that often “life events get in the way” of achieving one’s goal, the College employs a full time Student Services Coordinator who assists students with concerns involving day care, transportation, and other personal issues which may interfere with their completing school and obtaining their cosmetology license. Pivot Point Academies encourage and empower student with a simple phrase: “Design Your Life.” The school’s approach is one of partnership and positive reinforcement that emphasizes skills, technique, behavior and attendance. Pivot Point identified that a key element to creating culture is to make a personal, customized educational experience for each student. Communication and positive reinforcement is the foundation of Pivot Point’s approach, and a weekly “all school huddle” is just one highlight. The entire school gathers once a week to recognize student achievements. All Nurtur Aveda Institutes maintain an aggressive Facebook community strategy, with a dedicated page for students and graduates which fosters both alumni relations, education opportunities and career opportunities. Each Institute presents an annual fashion show and charity benefit as part of the Institute’s Earth Month activities. Each “Earth Jam” event includes an alumni segment. Graduates from Nurtur Aveda Institutes frequently return to the Institute to meet with students and to speak about their student experiences, transitioning from student to salon life, and other real-world experience, and many also serve as liaisons for their salons during the recruiting and hiring process.